Below are a few testimonials from some of our happy customers. If you’d like to add a testimonial about one of your experiences with us you can use the submission form at the bottom of this page. Having refinished our boat (and others) many times, I know exactly what it takes and I was a little nervous about letting someone else do the job for me. I wondered whether the same attention to detail would be paid by someone else who doesn’t love the boat the way I do. When we first spoke about Runabout Restorations completing the job, I knew the price Charlie quoted was right because I know how much time it takes to do the job properly. Having seen Charlie’s work on other boats, I came to the conclusion that he was the right shop to give Last Chance the care she needed. When Charlie called to tell me it was time to bring her in, I was impressed that he started the job immediately. His “stop by anytime” invitation was reassuring and his in-progress photos were what finally put me completely at ease, knowing I had made the right decision to entrust Last Chance to a real professional. The repairs Runabout Restorations made to the deck seams and bungs have held up and the three coats of varnish have the decks and sides in Bristol condition. Once I received the boat finished, right on time, I was able to appreciate the attention to detail – no runs, no varnish where there shouldn’t be, expert tape lines (and no residual tape) – in short, a new finish with virtually no evidence that they touched the boat! We are very pleased with the price, the process and especially the finished result. Thanks to you and your mechanic, the boat ran better than ever! What a relief! I’d like to take a moment to thank you for your excellent re-finishing job on my 30′ Hacker. The job was done in a timely fashion and the finished product, deck and hull, exceeded my expectations. The few concerns I did have were dealt with immediately. Your years of varnishing experience are obvious. You may show my boat anytime. Karen and I are long time wooden boat owners and wish to express sincere appreciation to Charlie and his Runabout Restorations team for the great work performed on our boats! We have worked with others over the years and this has been by far our best experience with the least suprises. Working, or I should say collaborating with Charlie, has been most rewarding and enjoyable. Charlie has been a friend for many years and we certainly wish we had initiated our boat relationship years ago! Thank you Charlie. 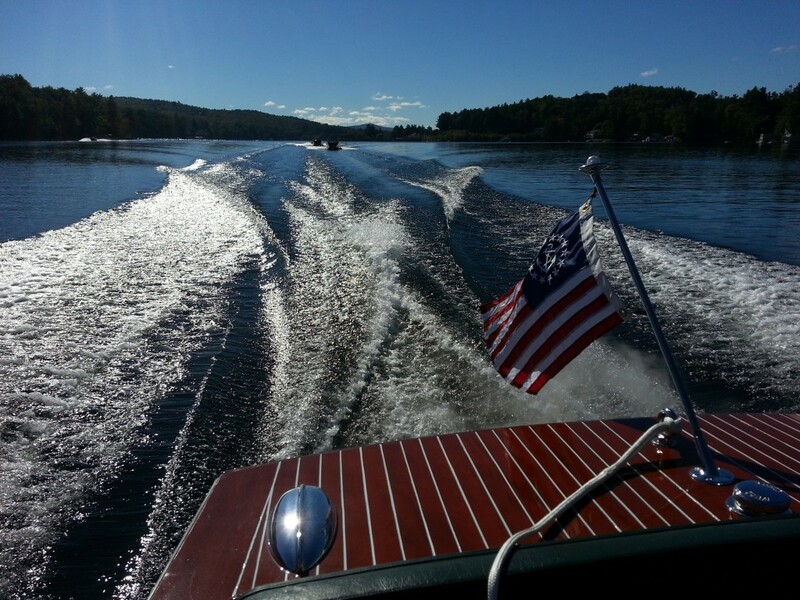 Charlie and his staff were instrumental in the entire process, from my purchase of the boat in Wolfeboro, right through the “shake-down” cruise at The Libby Museum, along with follow-up contacts after returning home to the Finger Lakes Region of New York State with Hessy. Charlie kept me well informed as to the progress throughout the restoration. The restoration was very professional from the quality workmanship through follow-up. “5 Stars”!!!! Thank you Charlie and staff. Charlie has been kind to offer the Boat Museum in Wolfeboro auction donations in the form of bottom paint or topside varnish for boats up to 28 feet. Over the past several years I have acquired two such auction donations . 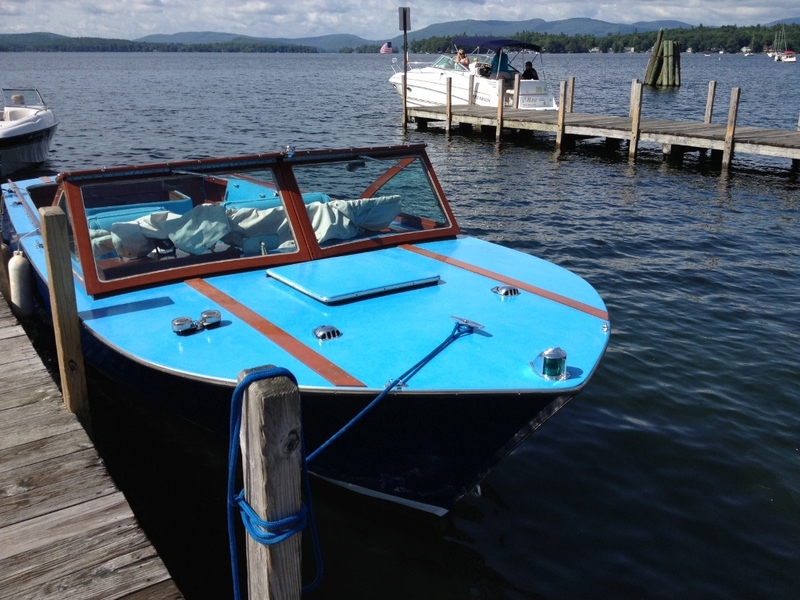 This fall it was time to freshen up Yum Runner, our grandchildren’s 15 ft 1957 Runabout. 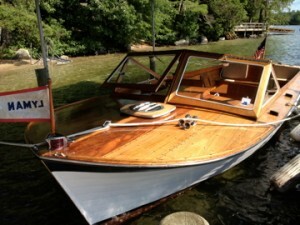 I restored this boat for them in 2009 and it was due for freshening up. Charlie honored the two auction “tickets” and did complete bottom, sides and deck varnish ( with an add on payment from me) The boat was done promptly and I was quite impressed with the attention to detail and workmanship. I would strongly recommend him to others and will be considering going back to him with another of my boats soon. We were very lucky to have found Charlie and Runabout Restorations. Another boatyard (which no longer worked on wooden boats) referred us to Charlie. He carried out a complete restoration of our 25’ Chris Craft triple cockpit runabout. 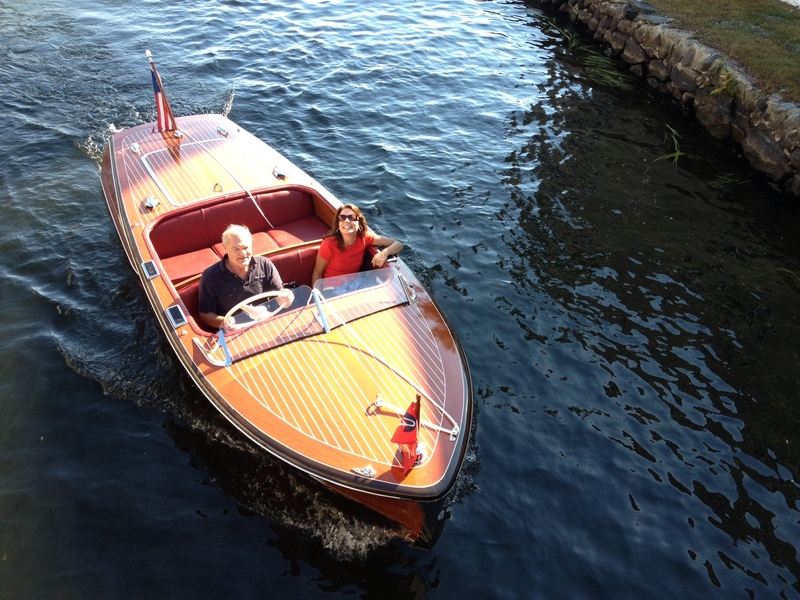 The job is so perfect that occasionally people think that the boat is a modern reproduction – but it is a 1938 Chris Craft brought back to life with a new engine. We had earlier replaced the original engine so restoring the original engine was not an option for us, but Charlie reinstalled the original dashboard (with updated wiring) and a terrific new engine. The workmanship is outstanding. The old varnish was completely stripped off, short boards used in repairing an earlier accident were replaced, the chrome was redone (and a new cutwater was made to replace the original broken one) and so many coats of new varnish were carefully applied that the hull is a mirror. I am writing this letter to express my satisfaction with the work done on my 1952 Chris-Craft by Runabout Restorations located Melvin Village, NH. 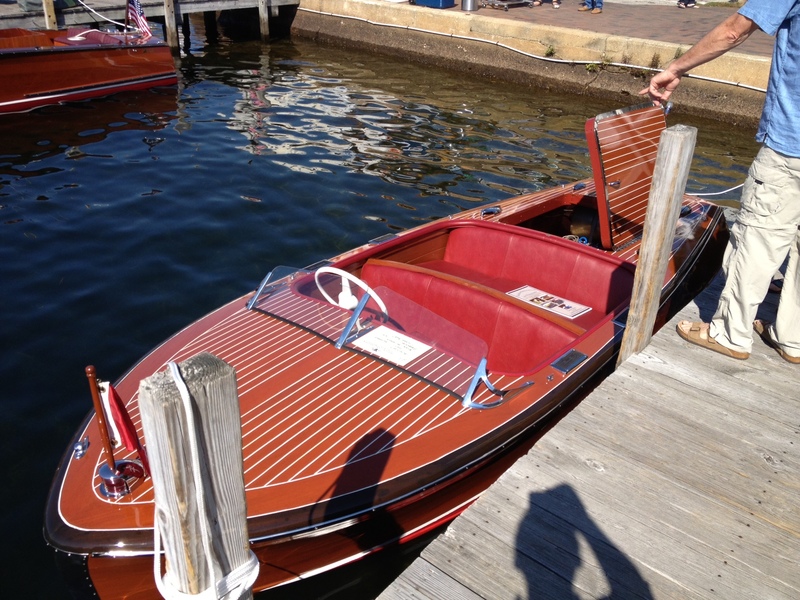 Runabout Restorations and crew carried out a substantial restoration of my boat during the fall/winter of 2011/2012. Most of this work involved the hull, but some work was done on the engine as well. The boat was returned to me looking terrific and running very well. Charlie and the Runabout crew have since made a few calls to my boathouse to perform minor repairs and adjustments to the boat. They have always been prompt in responding to my calls for their help and they made sure that I was happy with the results of their work on these occasions. Charlie has also taken the boat for preparation and storage for two winters. The boat was returned to me early in the summer of 2013 in excellent condition and, again, running well. I have been very satisfied throughout my relationship with Runabout Restorations. I feel that I have received high quality work at a reasonable price and am pleased to recommend this company to others. I am writing this letter to express my satisfaction with the work done on my 1952 Chris-Craft by Runabout Restorations located Melvin Village, NH. 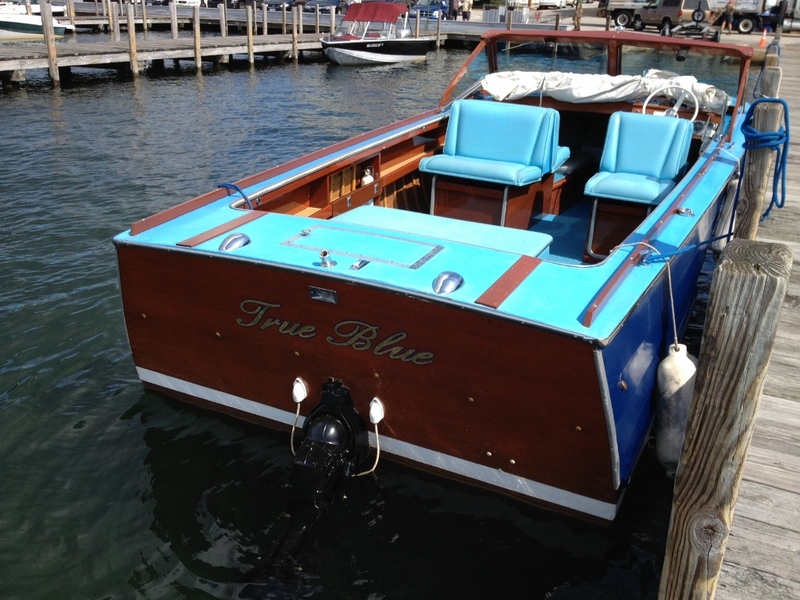 Runabout Restorations and crew carried out a substantial restoration of my boat during the fall/winter of 2011/2012. Most of this work involved the hull, but some work was done on the engine as well. The boat was returned to me looking terrific and running very well. Charlie and the Runabout crew have since made a few calls to my boathouse to perform minor repairs and adjustments to the boat. They have always been prompt in responding to my calls for their help and they made sure that I was happy with the results of their work on these occasions. Charlie has also taken the boat for preparation and storage for two winters. The boat was returned to me early in the summer of 2013 in excellent condition and, again, running well. I have been very satisfied throughout my relationship with Runabout Restorations. I feel that I have received high quality work at a reasonable price and am pleased to recommend this company to others. I purchased my first boat last October; a 1964 Cruisers, Inc. Navigator, a 23 Ft wooden Lapstake Utility. To be sure she was a “good one” before I took the plunge, I had her inspected prior to purchase and learned she could use some refurbishing, having sat idle for about 3 years. Fortunately, I was put in contact with Charlie Wallace’s Runabout Restorations. Charlie and his crew did an excellent job getting my boat in the water safely, and both looking and running great. His workmanship and service are outstanding. From the pick-up last October after I purchased True Blue, and several times over the Summer when I needed help, Charlie was there immediately. His actions show he truly cares about his customers. I trust Charlie to do what he says he will do, and I will be sending True Blue back to Runabout Restorations for continued care and detailing in preparation for the 2015 Season. Thanks, Charlie! Charlie and crew did an excellent job replacing the deck and refinishing my 17" Chris Craft 1947 runabout. The finish work was impeccable and the engine rebuild was really well done and looked like new. Charlie is my classmate from Laconia High and he is one hell of a boat restorer. Truly his life calling! Thanks to you all for a beautiful job!! Take your boat to Runabout Restorations! I have 1958 HiLiner that was purchased new by my father and grandfather. Charlie and Steve understood that the boat has more sentimental value then monetary. I was left feeling that they felt that my plywood boat was as valuable as the beautiful Chris Crafts and Centuries that were in the yard, the memories are why we love the boats we own and Charlie and Steve get that. My boat was "worked in" during the busy pull out season. 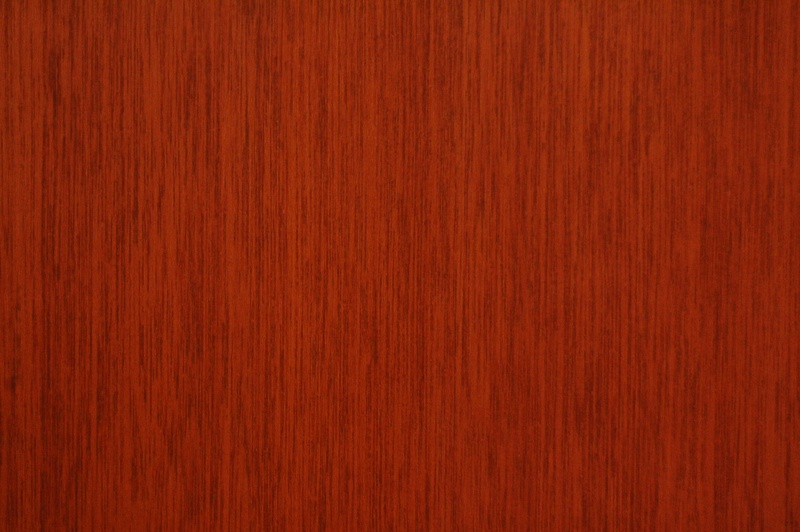 A loose top plank was repaired in way that is safe, un-noticiable and reasonably priced. Both Charlie and Steve offered advice and expertise freely, boat guys to caretaker, the definition of top notch customer service. It is my hope that more generations of my family will be able to make memories in our HiLiner, in much the same was as I did with my dad and he did with his, Runabout Restorations will help make this happen. Thanks again to Charlie and Steve for the great work, advice and the pride you take in fixing wooden boats.